That’s right. Now he’s on number 52. But this time, he’s for sure. After all, Jupiter is in Virgo’s birth canal. 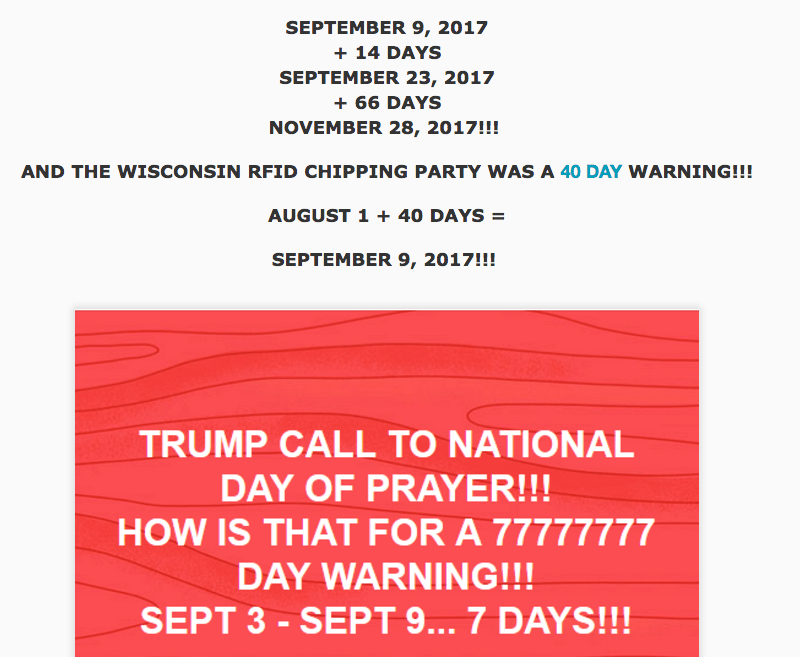 Now, one might ask why someone with so many false prophecies is continuing to prophesy. But let’s be honest – that’s not the type of person who would listen to modern prophecy in the first place. That’s the type of person who watches TBN, who is probably immune to any and all forms of basic logic or biblical discernment. Ironically, the last time Fletcher made a false prediction, he clearly asserted that if he was wrong he was obviously a false prophet and shouldn’t be listened to anymore. Nonetheless, Fletcher now claims the world will end (or the end will begin) with the return of Christ on Saturday. Here’s how Fletcher does the math to come up with September 7 as the day it all ends. There you have it, folks. That’s the math. Now, one would think that Fletcher is just a random crazy guy preaching to himself in the corner of an asylum somewhere. But, no. Fletcher has reached his friends limit on Facebook and has a good number of sincere followers. 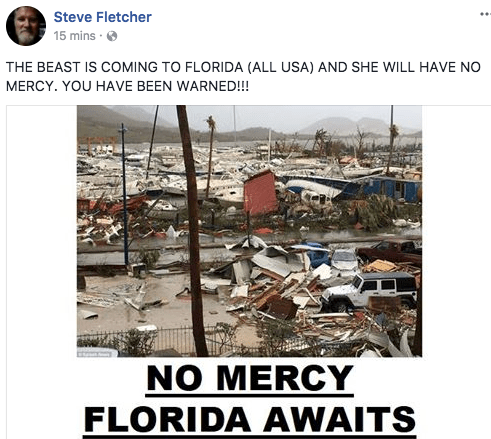 In fact, he was making a prediction that Hurricane Irma was “the beast” of Revelation just today. According to charismatic leaders, like Michael Brown, a true prophet can still (accidentally) prophesy falsely. According to Third Wave charismatics, like John Piper and Wayne Grudem, the prophecy can still be infallible and from God, even though the prophecy may be conveyed with fallibility (IE, the prophet got a word from God, but misunderstood it). So, according to charismatic leaders, there’s no way of knowing for sure that Fletcher is a false prophet. It could be he’s just mistaken. A lot. Next story Huckabee Joins TBN Circus in Sideshow About ‘Murica.